Try out a Peanut Butter, Banana & Marshmallow Sandwich! 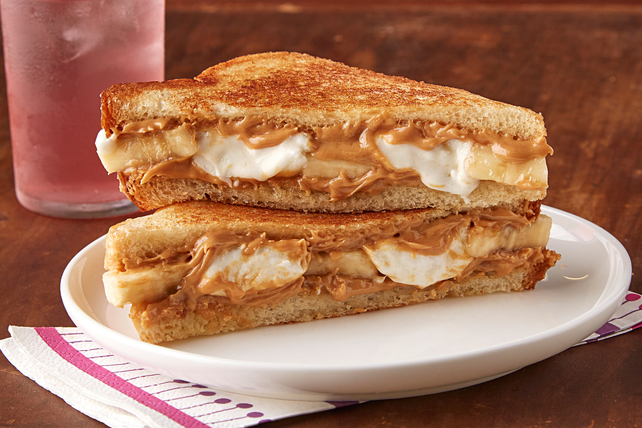 Real marshmallows are a treat in this grilled Peanut Butter, Banana & Marshmallow Sandwich. Spread bread slices with peanut butter; fill with bananas and marshmallows. Cook in skillet on medium heat 2 to 3 min. on each side or until marshmallows are melted and sandwich is golden brown on both sides. Serve this delicious sandwich for lunch along with some crunchy fresh vegetables. Then, round out the meal by adding a serving of fresh fruit. Substitute 1/4 cup Jet-Puffed Miniature Marshmallows for the halved regular marshmallows.